Six common pieces of gear and why you’re better off leaving them behind. Blake Herrington rappels in the Mendenhall Towers, Alaska. He and partner constructed this rappel line and each rappelled it 3 times in the course of a week, using just 6mm cord and no rappel rings. Backpackers cut the handles off their toothbrushes to save weight. Alpinist just don’t brush. But while we meticulously save grams for multi-day trips, many of us carry far too much gear around on our harnesses for a day at the crag, attempting a hard lead, or an afternoon of multi-pitching. Before leaving the car or tieing into the rope, analyze your gear and strip off the items that aren’t vital. You’ll climb harder and have more fun. Cordellettes – Your three-part anchor isn’t equalized, despite how many acronyms were utilized in its design. Cordelletes are easy, but they are also slow, bulky, and typically made from static material that isn’t as strong as the dynamic alternative (the rope) that you’re already attached to. Build an anchor with a 4’ runner and/or the rope, both of which are multipurpose items that will be with you anyway. If you are leading in blocks, just make sure you can easily extricate yourself from the belay gear to lead the next pitch. If you expect having to build multiple rappel stations, some 6mm or 7mm cord is a great choice, but as a must-have item for all multipitch climbing, the cordellette doesn’t fit the bill. Rap Rings – I used to carry some of these. I still have a few clanking around amid the clutter of my odds-and-ends box. When I’m looking for my missing offset wire or hibernating v-thread tool, I see them and wonder what I was thinking in buying them. Unless I am going climbing with the explicit purpose of creating a permanent and popular rappel station from atop a trade route, the rap ring stays in the garage. If you are making a new rappel station, just rap off cord and rotate the piece to spread out wear. If you are bailing off a cam or wire, you’ll want some cord or a carabiner to sling through the gear, not a rap ring. If you are backing up an existing station, just cut away everything except the one best sling, and add your new one without a ring, or else through an existing ring. If you’re a guide who wants to spruce up the anchors used every day in getting off the Beckey Route: Thanks! For you, rap rings make sense! 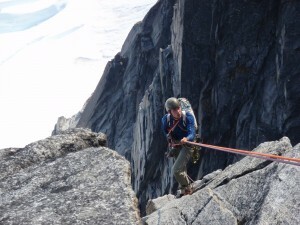 Daisy Chain / PAS – Sometimes these make sense, but seldom for hard cragging days. They are weaker than the rope and provide a static connection to the anchor. Their best applications are as dedicated aid-climbing tools. Quicklinks – See “Rap Rings”. Except these are heavier. The exception is that at least these work to leave on a bolt if you can’t A0 your way up that sport climb to the chains. But your junkiest carabiner will work even better. And using a carbiner on hand means you wont have unnecessarily brought that specialty item up the last 100 pitches “just in case”. Bulk Webbing – Cord is lighter, faster to tie, easier to V-thread with, easier to tread through constrictions, and a lot less bulky. You might even use it to build your anchors on the way up the route. Take that 25’ of meticulously-daisy-chained 1” tubular and make a slackline. Lockers – Locking carabiners are good, and small keynose lockers are the best. But more than a few is simply overkill. Companies now produce 41-46gram lockers which weigh less than the typical carabiner of 2 decades ago. But that doesn’t mean we should throw 3 more on the rack and carry the same total weight as the hardmen of old. Folks at single-pitch sport crags climb up and down 100’ bolted routes lugging 5 locking ‘D’ ‘biners between the ground and the chains. This is either an unusual form of training, or a lot of unnecessary weight. Even for long alpine routes, more than 3 lockers is overkill. Just make one of them a larger round-stock ‘biner for smooth belaying. Leaving the ground with enough gear, and the right gear, will make things faster, easier, and a lot more fun. Not only will you be lighter, but the lack of clutter will make finding the gear you do need a whole lot easier.